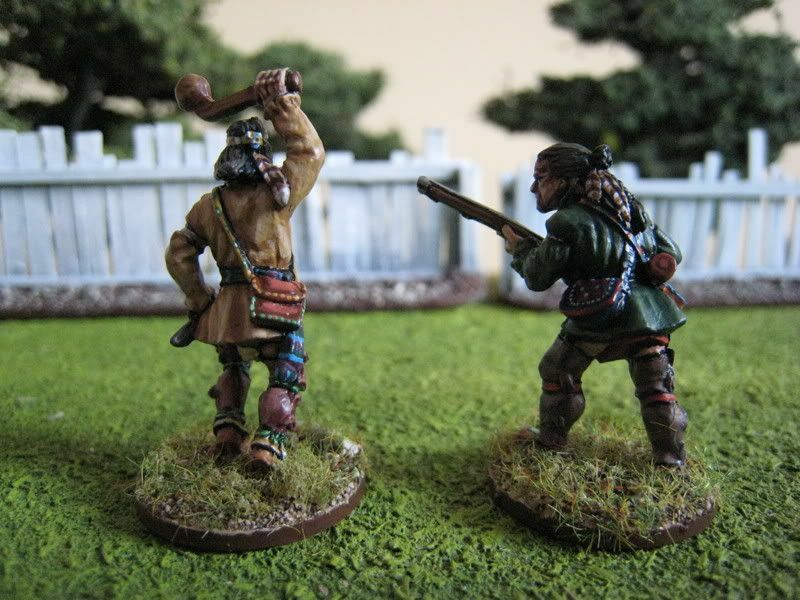 This is the first pack of Delawares from Conquest Miniatures' "500 Nations" range. Sometimes called by their own name of Lenni-Lenape ("lenape" meaning "original" or "real people"), the name "Delaware" derives from an early governor of Virginia called Lord de la Warr. The Delaware tribe originally inhabited what is now called Long Island and New Jersey as well as the Delaware River area, but began a Westward migration in the latter 17th century. This accelerated during the 18th century as colonists gradually displaced the Delawares from their ancestral lands. By the 1740s, the tribe was living in the Wyoming valley and western Pennsylvania. 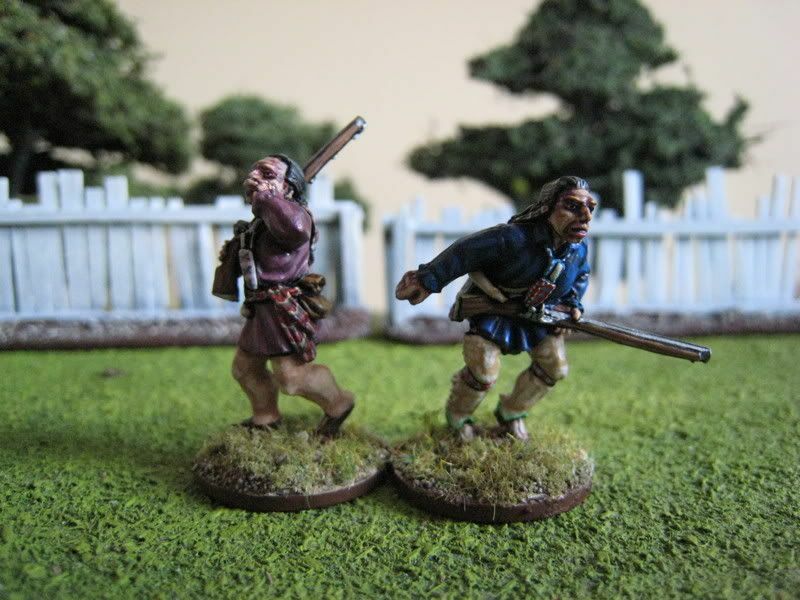 During the French & Indian War the Delawares attacked Pennsylvania settlements but were forced to abandon Pennsylvania in the early 1760s. Whilst some divisions of the tribe moved to avoid involvement in the AWI, other divisions supported different sides during the war. The migration westwards continued for the next 80 years or so, and the large groups of Delawares settled in Oklahoma and Kansas. 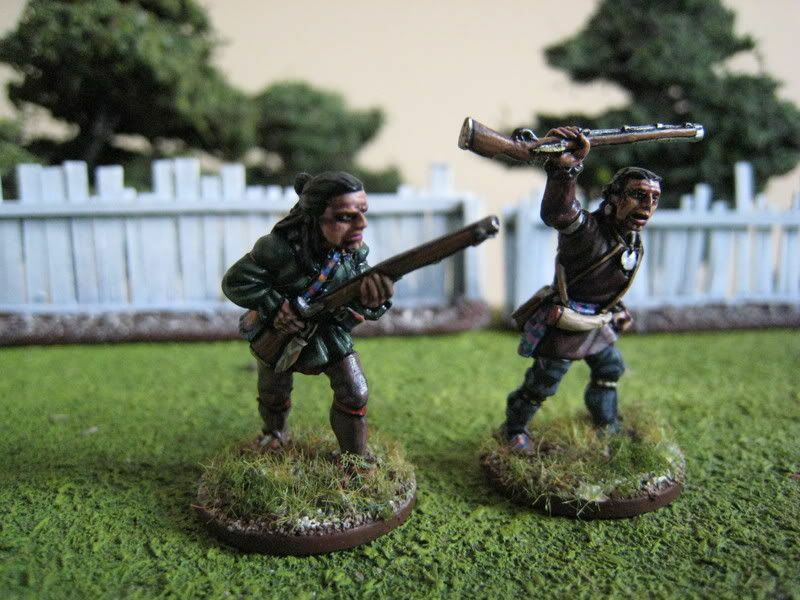 I don't really have any idea when or how these figures might feature in an AWI game, but they were great fun to paint and are lovely sculpts. Some research suggested that the Delawares wore very colourful clothes, or at least did from the early 19th century onwards. The Osprey book "Indian Tribes of the New England Frontier" has various photos and illustrations of intricate patterns on beads, sashes, pouches etc. Some very helpful people on TMP referred me to a couple of websites that have modern interpretations of the sashes that many Delawares wore. 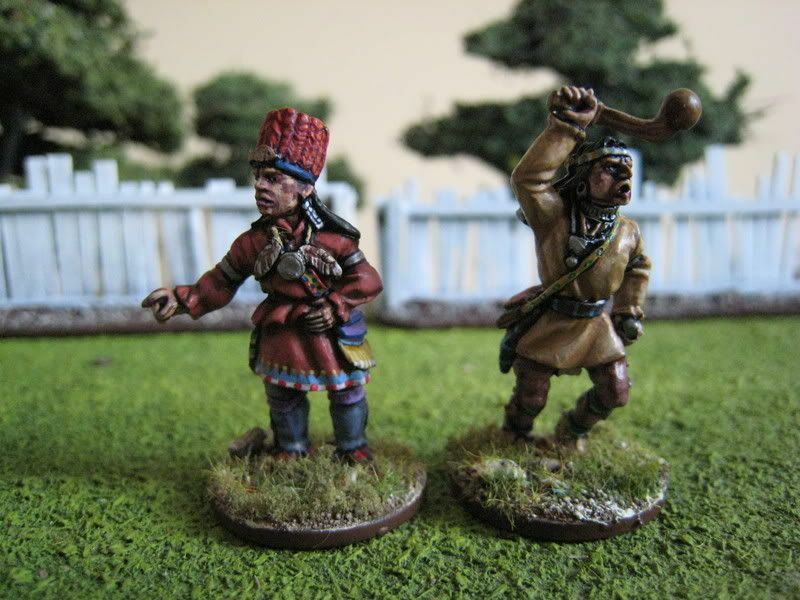 Whilst such colours may be a bit anachronistic, these references gave me an excuse to paint these figures in a colourful style that will differentiate them from my other indian figures. 6 figures. Painted December 2007. 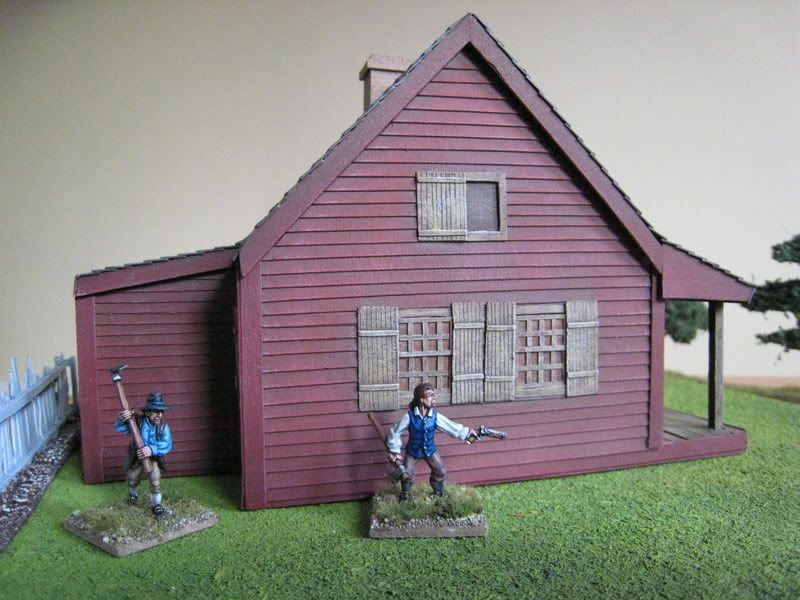 My model of Neilson's Farm arrived the other day, and here it is. The model was made by Tablescape (see their address in the links section) and I'm very pleased with it; the total cost for the painted model was £30. At the start of the Saratoga campaign, Neilson's Farm formed part of Gates' lines at Bemis Heights. A battery was positioned there and the fortified position was called Neilson's Fort. 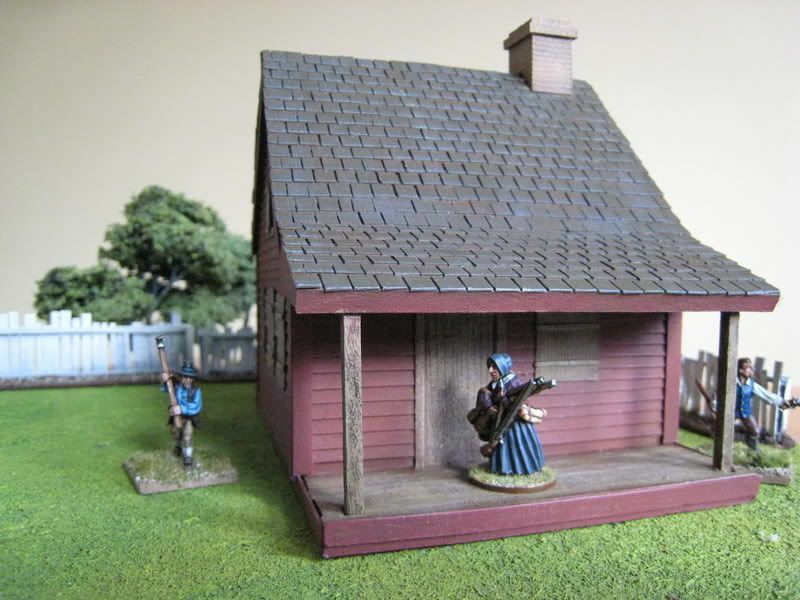 The building was a bit too removed from the battlefields of Freeman's Farm and Bemis Heights to feature in any refights of those particular engagements, but in design it is representative of the type of farmhouse that was in the area; absent any photos of Freeman's Farm itself, this model of Neilson's Farm will feature prominently in my refights of the first Saratoga battle. 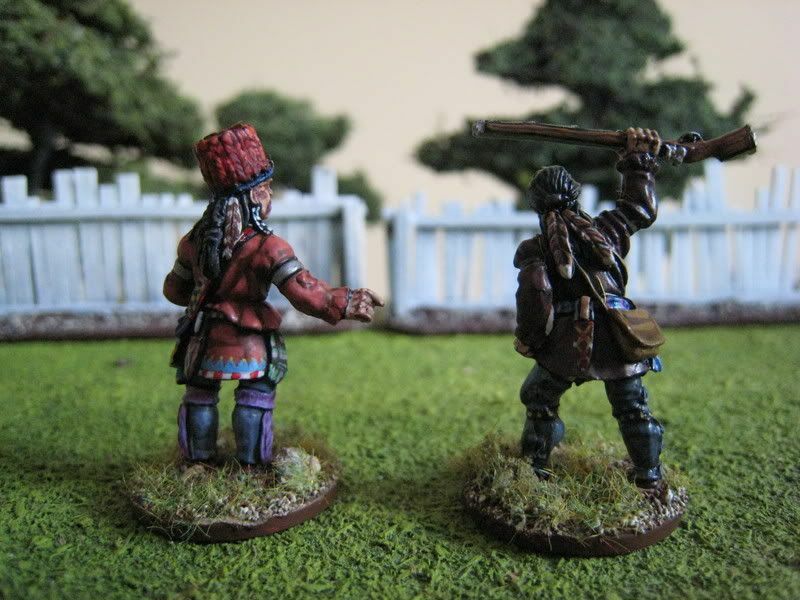 The figures are settlers from Conquest Miniatures. You can read more about Neilson's Farm here. Tablescape did an excellent job - I found out the other day that they even contacted the trustess who look after the site and obtained details from some original plans (presumably of the replica house that was built on the site) to double-check the dimensions. The model is also very light; I know Tablescape use light-weight material but this will be dead easy to carry around if the need arises. 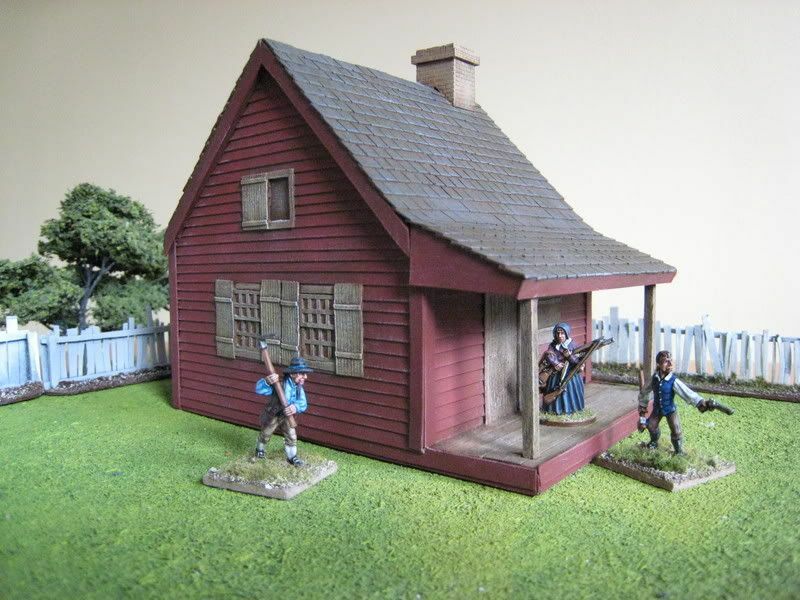 The same day I received this model I gave the chaps details of a few houses that are still extant on the Brandywine battlefield - those are their next projects! This regiment seems to have been raised in 1776 and served until 1782. Its colonel was originally Enoch Poor, but he handed over command to Nathaniel Hale upon his promotion to Brigadier. It fought in the Saratoga campaign, and part of the regiment was captured at the Battle of Hubbardton in July 1777. 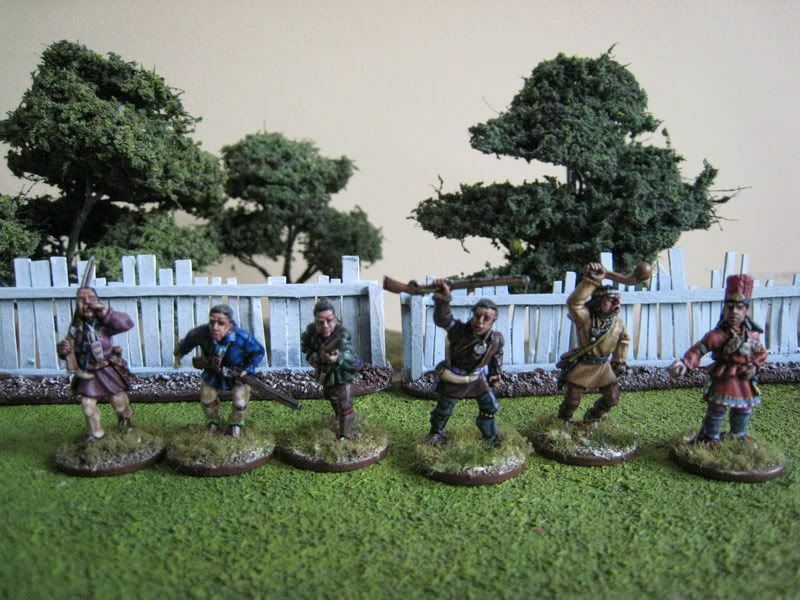 In the "British Grenadier" scenarios currently published, the regiment is fielded at 16-figure strength for Freeman's Farm and 18 figures for Bemis Heights. 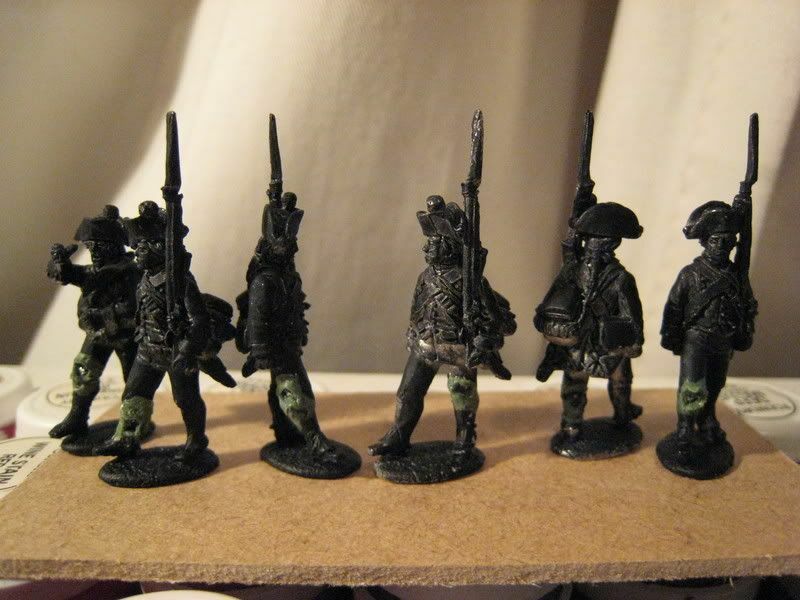 The figures used are Foundry marching Continentals. 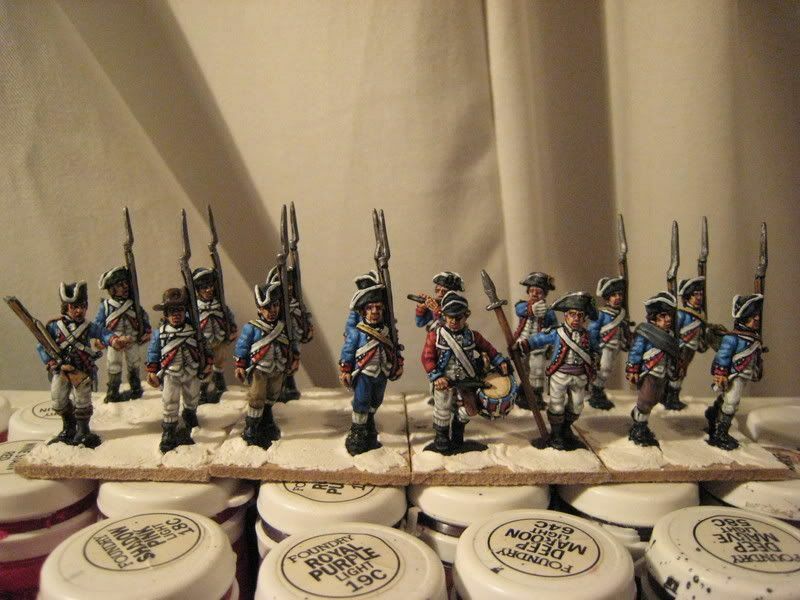 I wanted a "smarter" regiment that those I have painted recently; hence the white tape on the hats and lack of "ragged" Eureka figures. I've had these figures knocking around the lead-pile for a couple of years and thought they'd be best used en masse without any additions from other ranges. 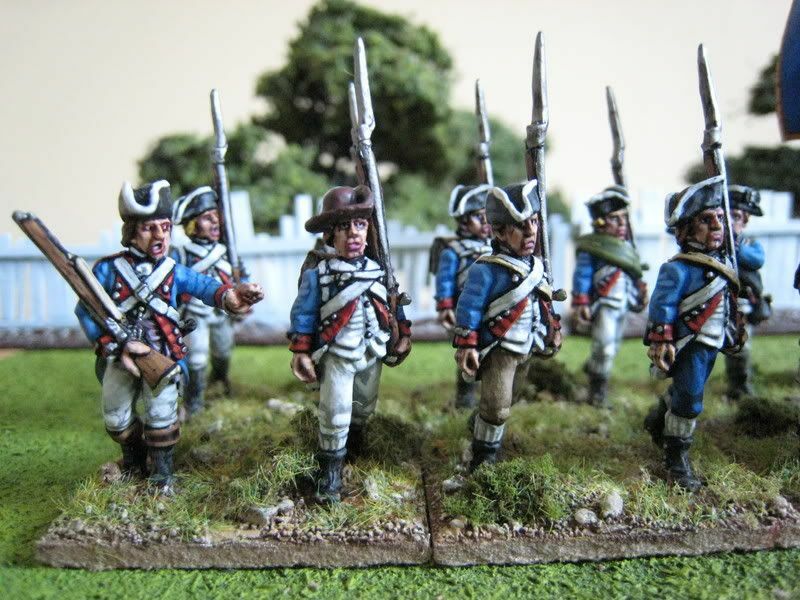 I wanted to paint this unit because of the distinctive sky-blue coats - it's not clear whether the entire regiment wore this uniform, but a couple of companies are recorded as having men dressed this way. 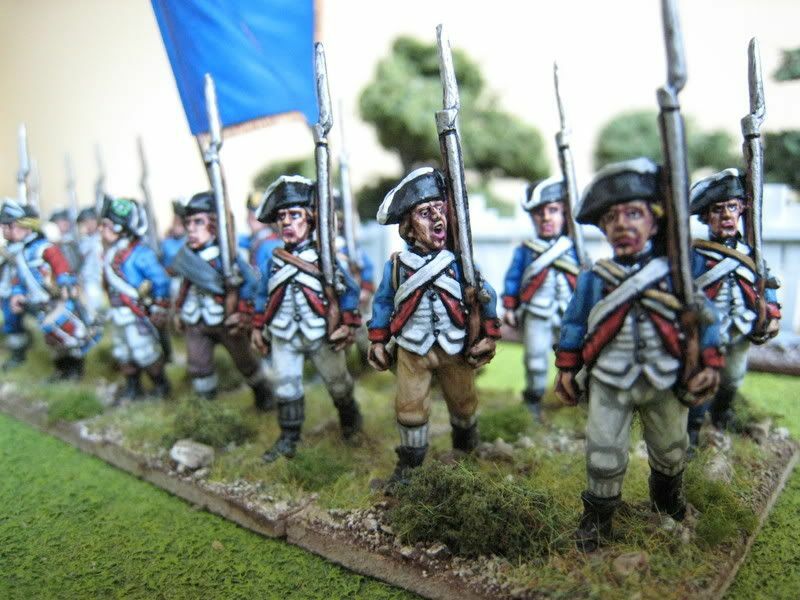 The blue coats were painted with the Foundry "Sky Blue" palette, with the second and third colours mixed to create an intermediate highlight before the "c" colour was used on its own. Legend has it that two colours belonging to the regiment were taken by the British at Hubbardton, one in dark blue and the second in buff with an interlinked ring design by Benjamin Franklin. You can see computer prints of the two flags here . GMB make a pack which has both flags and I did some research to see which flag should be given to this unit. It seems that the second, buff flag, has a lesser claim to authenticity that the dark blue one. 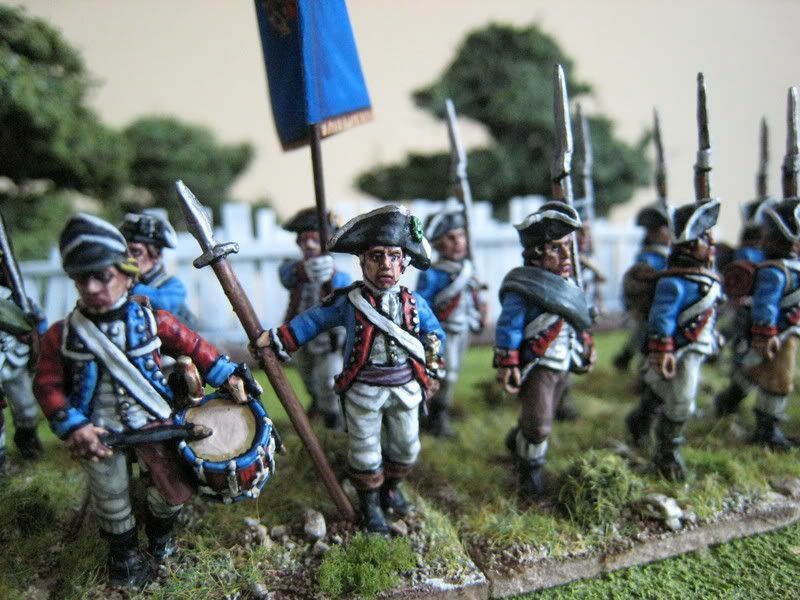 Various online sources, including the re-enacted New Hampshire regiments, seem to conclude that the dark blue flag was most probably carried by the 2nd New Hampshire Regiment whilst the buff one belonged to another unit. 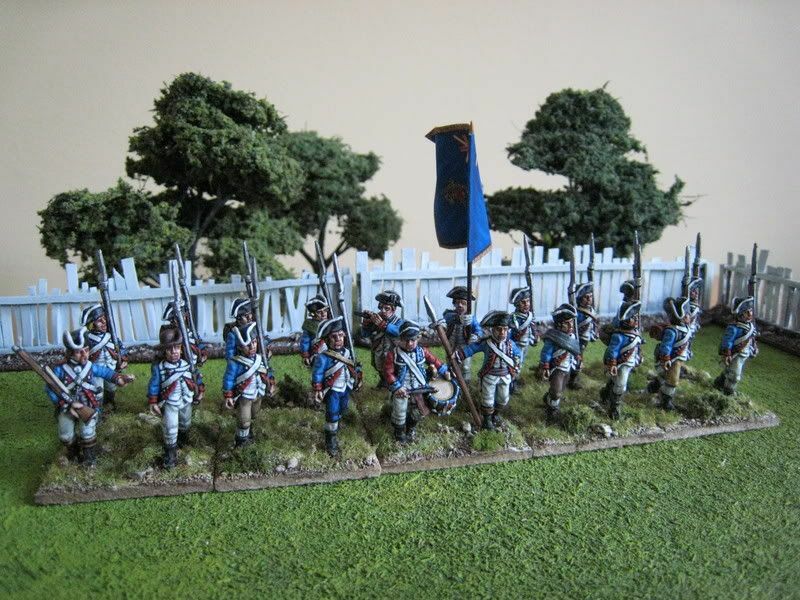 I saw references to this buff flag perhaps being used by the 1st New Hampshire Regiment, so I decided that I would paint up 2 NH units and distribute the flags accordingly. 20 figures. Painted November 2007. Flag by GMB. A short hiatus again whilst the new stuff is based. 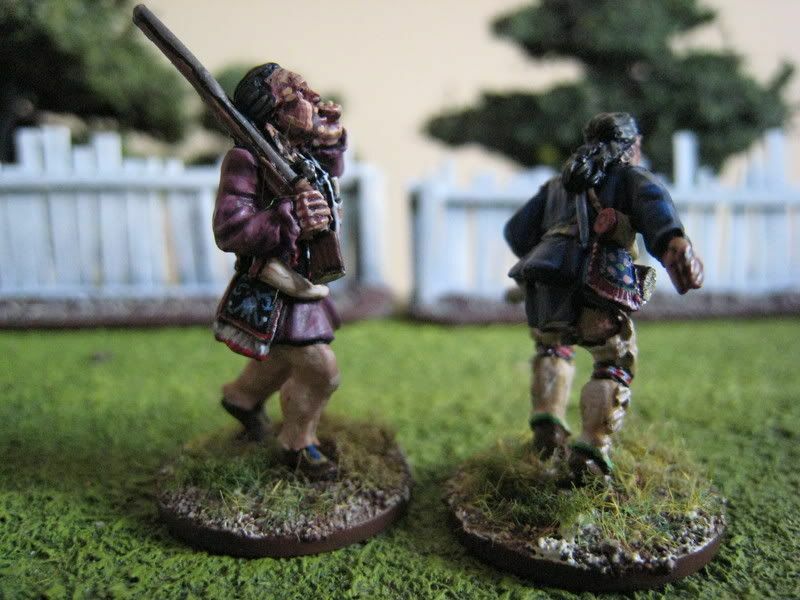 The 2nd New Hampshire is now almost finished; the final 4 figures will be varnished tomorow morning. Above are two "work in progress" shots taken last week. This 20-figure regiment is going to be one of my smartest Continental units, which probably means that it will never last more than 3 turns in any battle before being routed...The regiment has some interesting flag history, which I shall talk about in my next post. Plans for December? Well, it's Christmas (which of course means lots of shopping) and next week will be very busy at work; so I'm not going to set myself too hard a target. 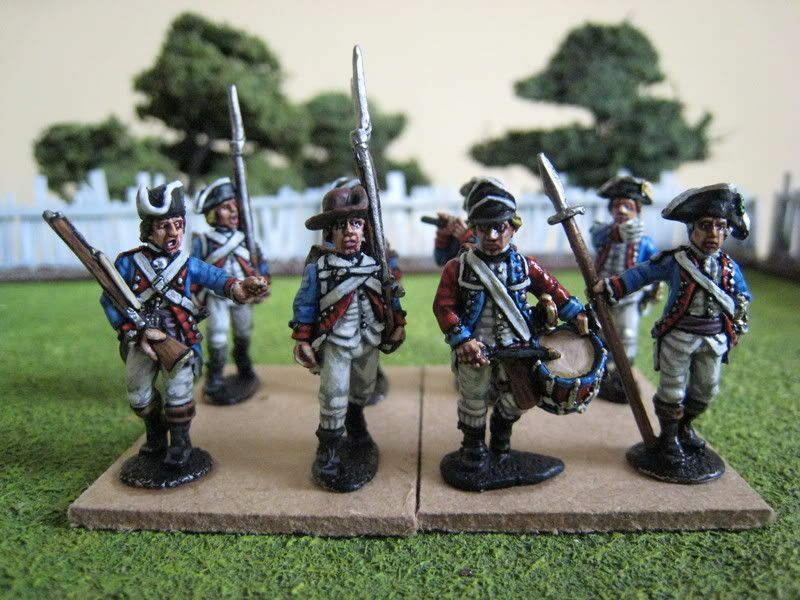 I want to do the Hessian von Bose Musketeers, because I just feel the urge to paint more Hessians, although the next batch on the painting table is some Conquest Miniatures Delaware indians. 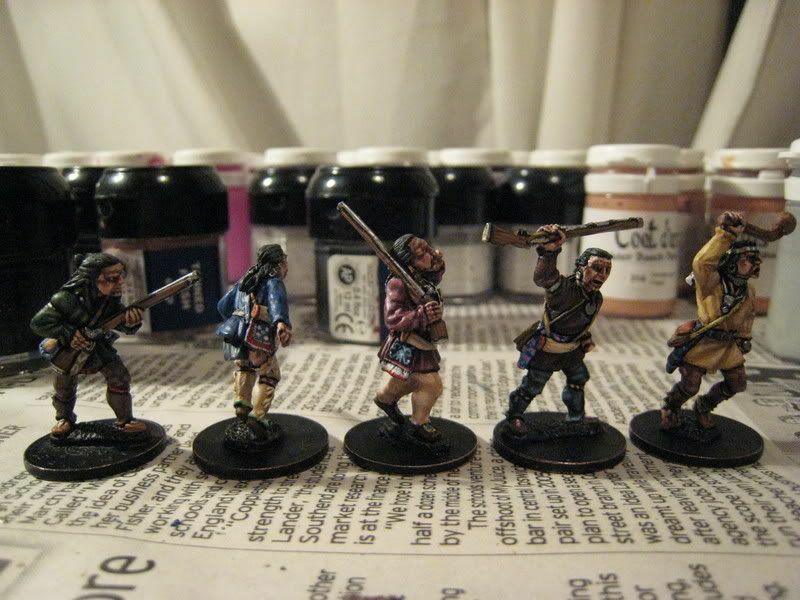 I also have a couple of random bits and bobs that I want to do, and some Nap cavalry that I've been postponing for ages - I see xmas as a time to catch up with all kinds of things I have neglected over the past few months: I must finish my first Sudan Beja tribe, 40 of which are already painted, leaving another 20 to do (photos only when the entire 60 figures are ready). The first week of January 2008 will mark the first year of this blog.......many thanks indeed to everyone who's travelled along with it. 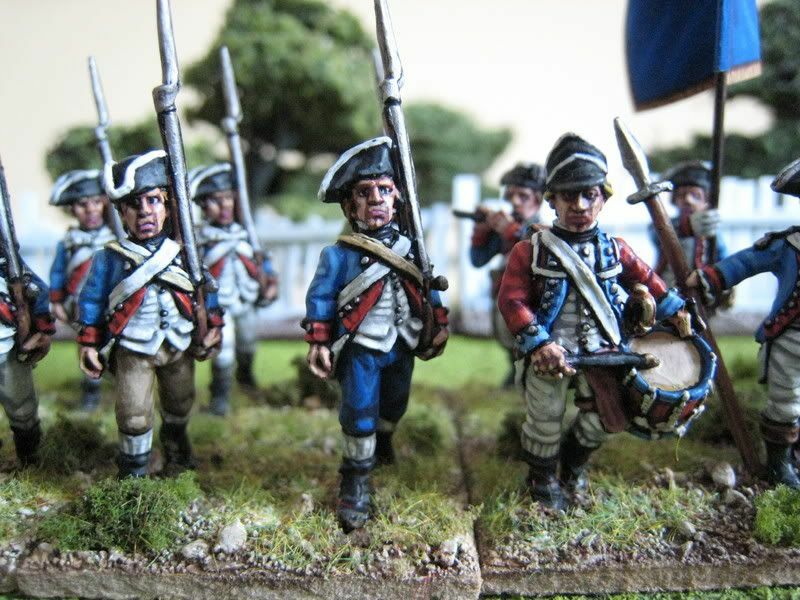 As an "anniversary post" and in response to the many emails (well, the 3 emails) I've had asking how I paint, in the New Year I will try to post a "how I paint regimental faces" article, i.e. how I try to "gel" 16 figures' faces together into something that looks like a regiment. I've been thinking about this the past couple of months and have concluded that it's dead easy; all you need is a 0000 paint brush, brand new pots of white and black paint, 4 decent flesh tones, a bit of patience and some very relaxing background music (such as Bach, Handel or Sir Arnold Bax).